With the Halloween only days away, the fans of horror and grizzly ghouls stories will be more than happy to revisit this 2011 NetEnt release. The slot is set against the backdrop of a creepy attic in a desperate need of cleaning, filled with chilling objects and unfriendly looking spiders. This, together with the spooky background sound effects resembling wind howling in the dead of the night, creates a pretty scary and unsettling ambiance. If you are still brave enough to play Mythic Maiden, you will be interested to know that the Scatter (rotating blue and red lights symbol) can unlock up to 30 Free Spins. Not only that - during this bonus round, additional free spins can be won, and the extra feature will last until you run out of luck. If you manage to form a winning combo with the Wild (a full moon turning into a skull), all bet lines wins will increase by 3x. While the Iron Maiden herself is position to the right of the game screen and closely watches your ever move, symbols like shrunken head, gaping skull, book of spells, tarantula and treasure chest all add to the appeal of the slot. Meanwhile, low-value icons are depicted as melting candles in the shape of playing card icons Ace, King, Queen, Jack and Ten, making sure all game symbols fit the prevailing theme. 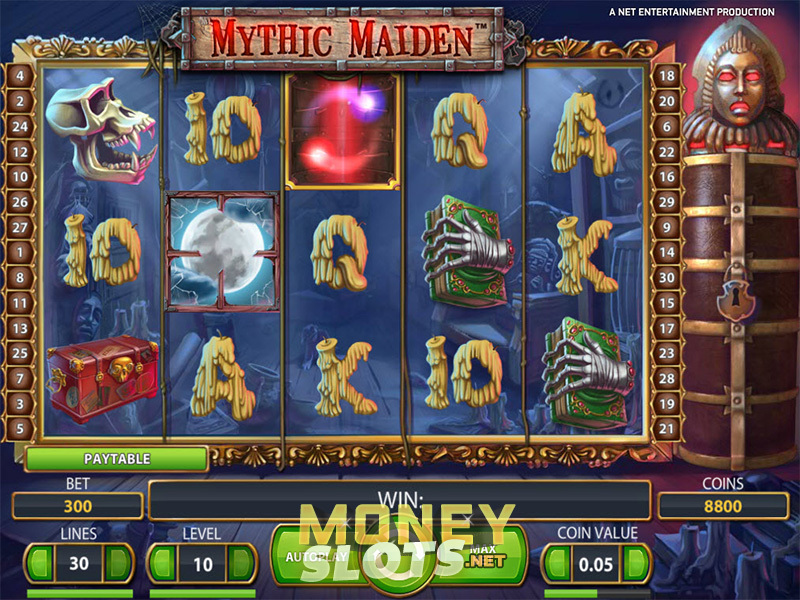 Mythic Maiden has 3 rows, 5 reels and 30 paylines. Bet lines are paid for successive combinations from left to right, with only the highest wins considered as valid on a single active pay line. The coin value ranges from $0.01 to $0.50 and the number of active lines and bets can be manually adjusted. Max Bet feature can be selected, adjusting your bets at the maximum of $300. Obtain three, four or five Scatter icons in any position and you will win 10, 15 and 30 free spins respectively, where all Wild wins come with x3 multiplier. With Auto play option, you may select the number of automatic spins, which can be either stopped manually by the player or according to predetermined settings. If you would like to speed things up, Quick Spin mode is also available. With the possibility of up to $600,000 jackpot, the Mythic Maiden is a medium variance slot, with 96.6% return to player. This means that the slot is stable enough to support a higher coin value and investment, but the safer strategy would be to decrease the coin value and increase the number of active paylines. This may keep you rolling for a longer period of time and increase your jackpot chances. The Mythic Maiden is available on Mac, iPhone, iPad, Windows and Android Devices. If you are an android user and would like to access the game from your phone, you will be requested to change the settings to landscape mode in order to play. Otherwise, the quality and the graphics will not be compromised, while the rules and features remain exactly the same.